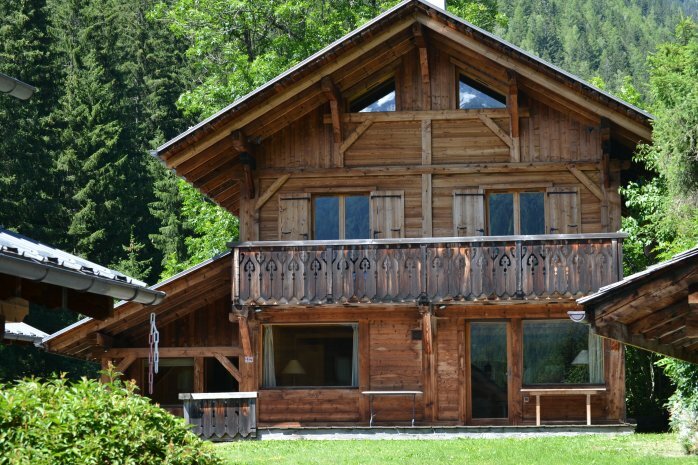 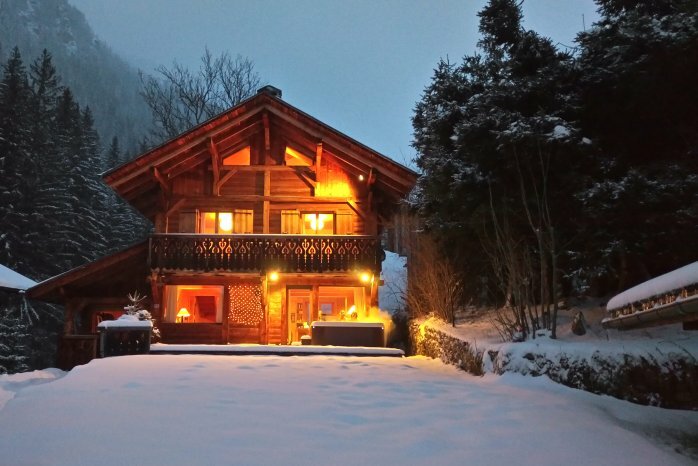 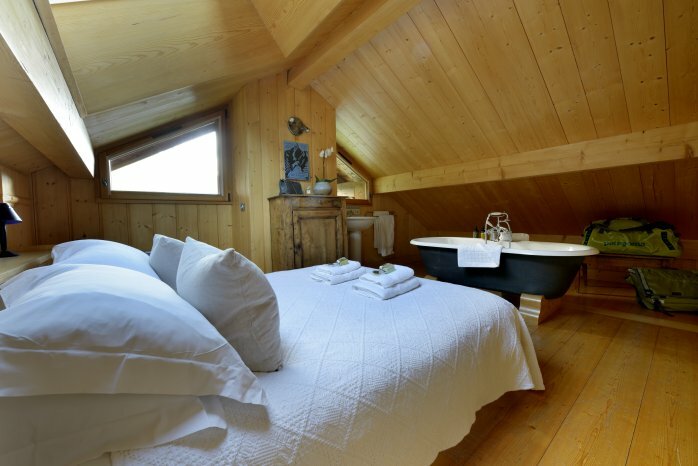 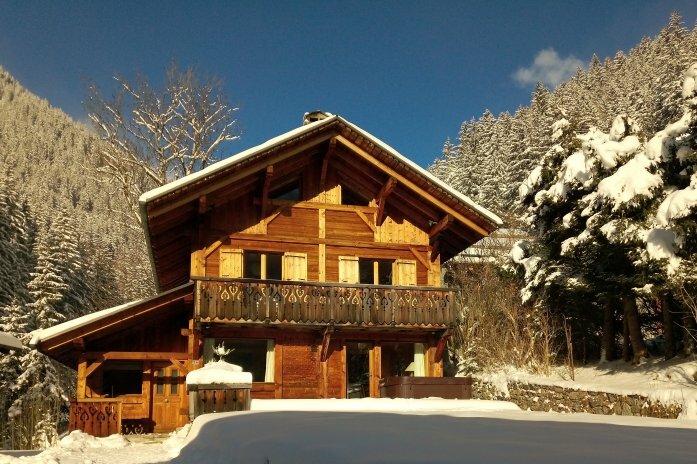 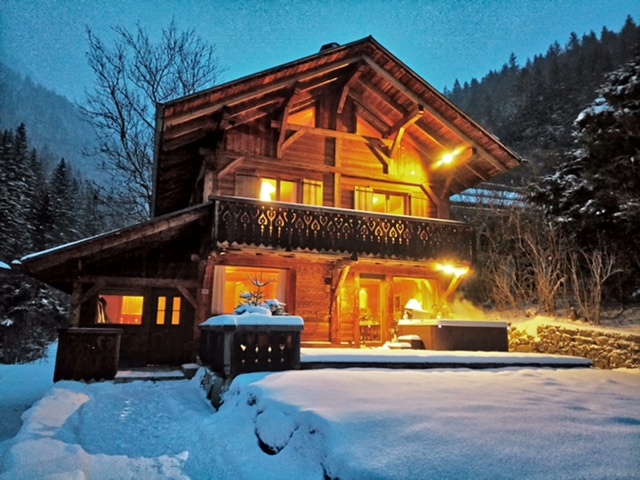 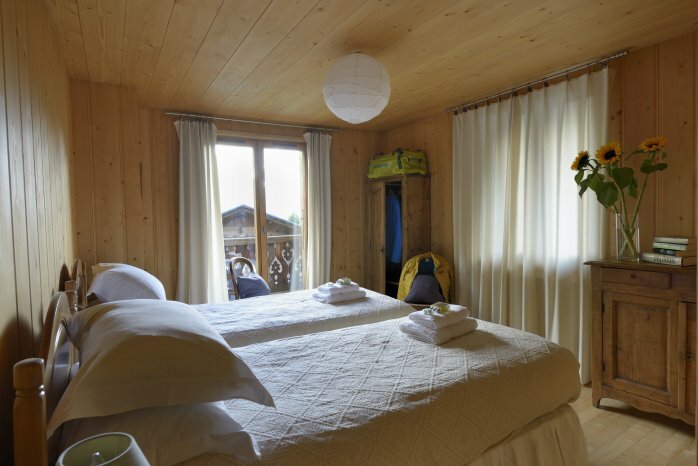 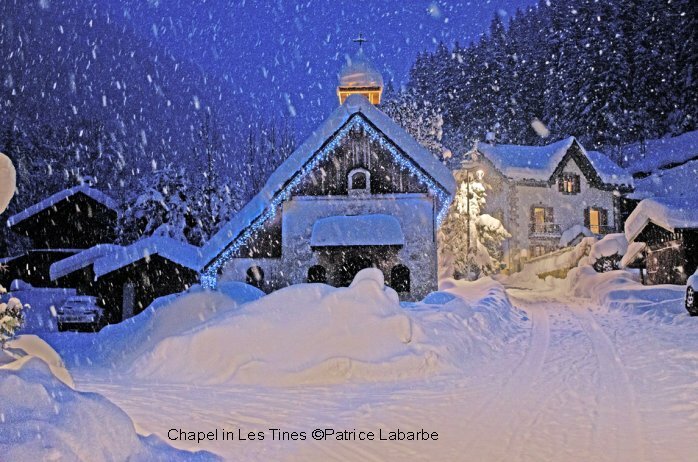 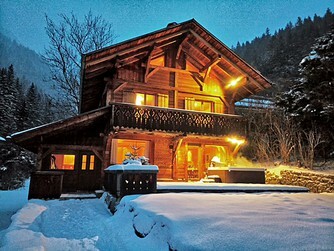 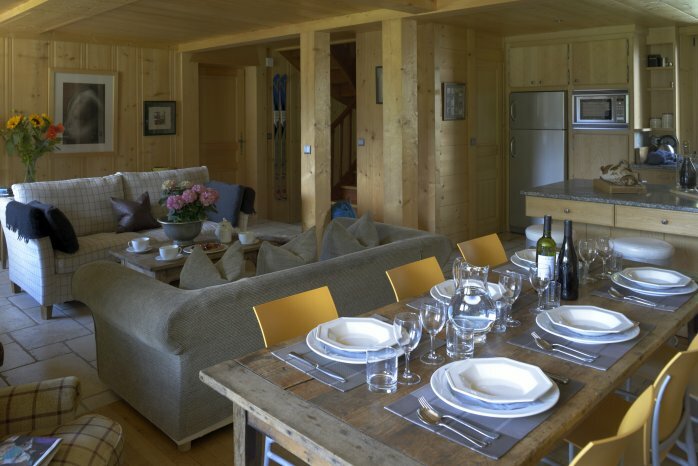 Chalet Scierie is a beautifully renovated detached chalet in a wonderful mountain setting next to a chapel; with the sound of the river running past and fabulous views of Mont Blanc it really is idyllic. 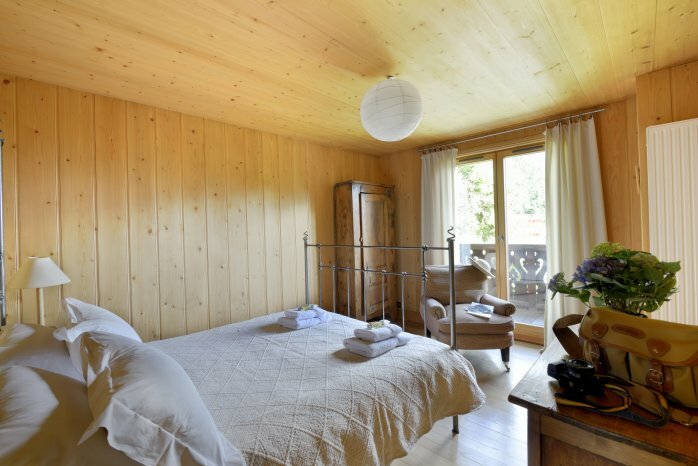 It is situated in the hamlet of Les Tines, a quiet spot ideally situated for mountain walks, with paths onto the Petit Balcons Nord and Sud quite literally just around the corner. 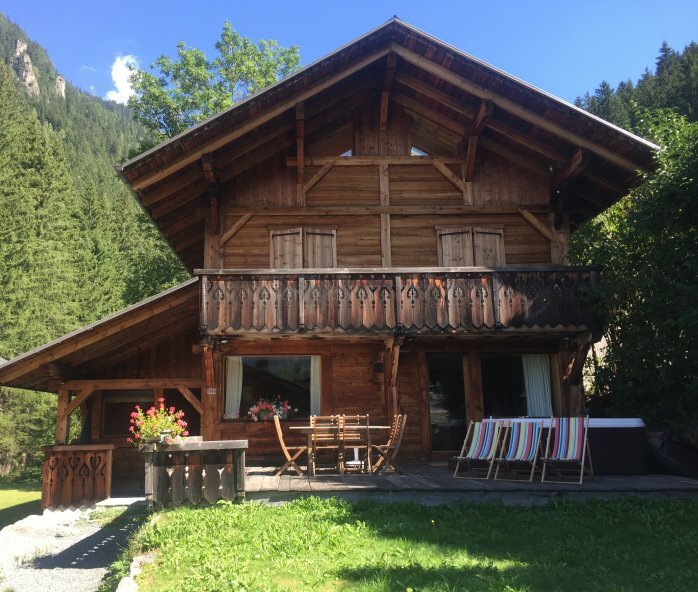 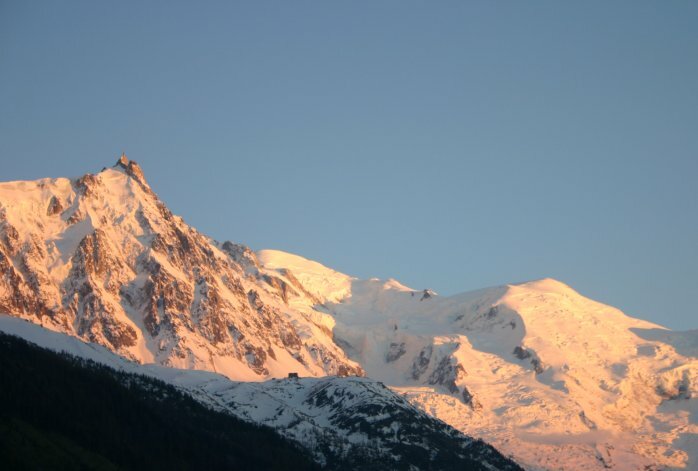 The hamlet is close to both Chamonix and Argentiere as it lies just over 5 minutes' drive from either, and it also benefits from a good bus service and the little mountain train which runs up and down the valley between St Gervais and Martigny in Switerland. The living area is open plan, incorporating the kitchen, dining and sitting areas. 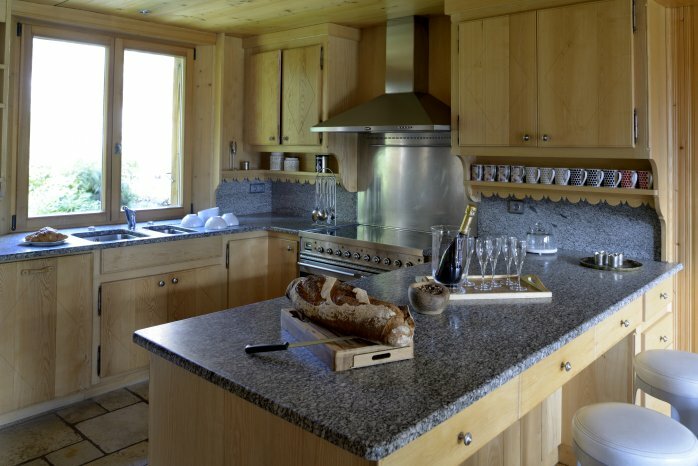 The hand-made kitchen has a beautiful range, breakfast bar, granite worktops, dishwasher, microwave and large fridge with a small freezer unit. 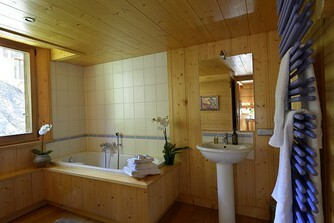 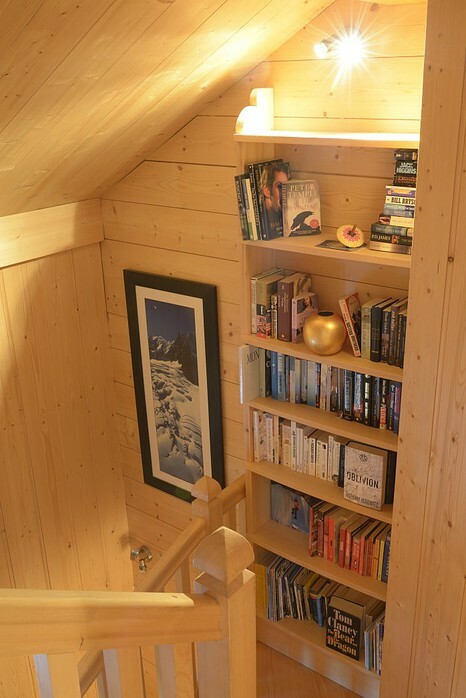 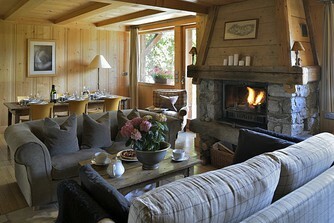 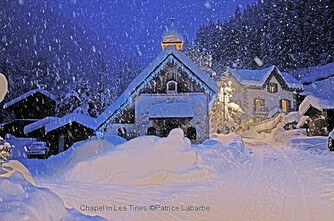 The chalet also has a washing machine and tumble drier in the spacious cellar/basement. The living/dining area is perfectly suited to relaxing in comfortable chairs around the fireplace, with large windows looking towards Mont Blanc and some beautiful sunsets. Upstairs on the first floor both of the bedrooms have French windows leading to a balcony with the same beautiful view. 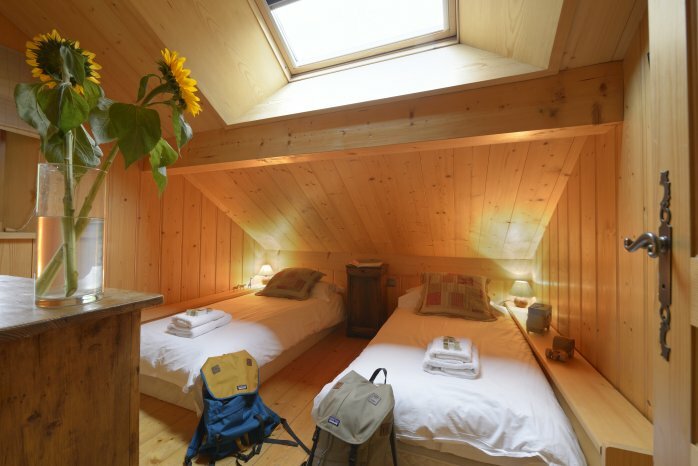 On the second floor one of the two bedrooms has a free standing bath and basin, the other is a smaller twin/double bedroom with a basin, and the low beds in this room run into the pitch of the roof. 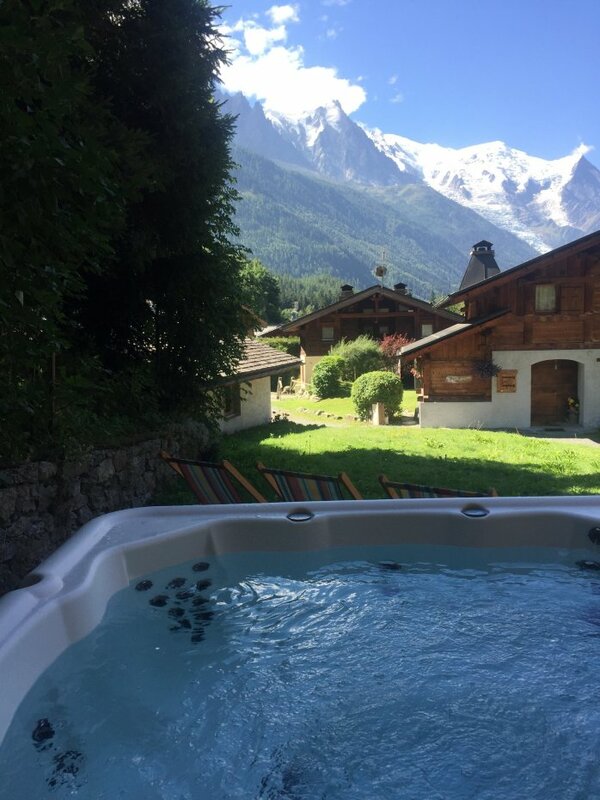 Outside there is a garden and a hot tub on the decking, together with garden table and chairs where you can enjoy your meals in this sunny spot, with Mont Blanc as a backdrop. 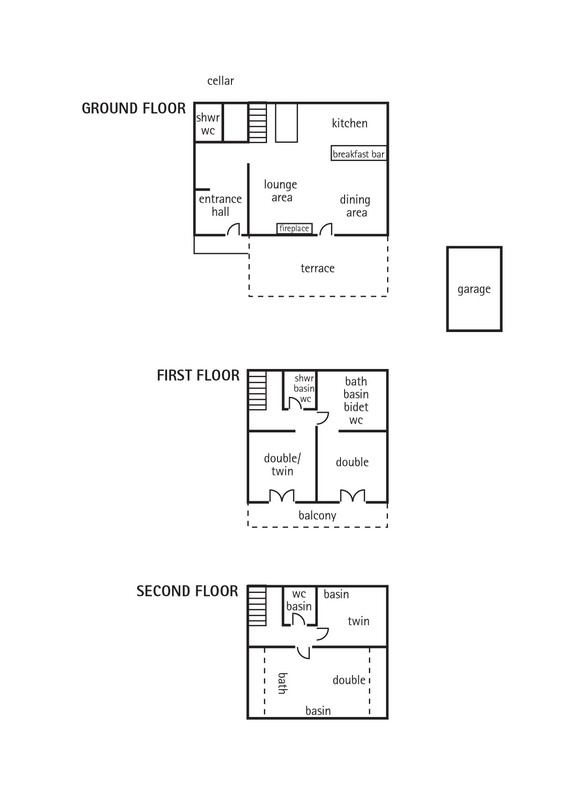 There is also a garage with plenty of space, tucked in on the right hand side.